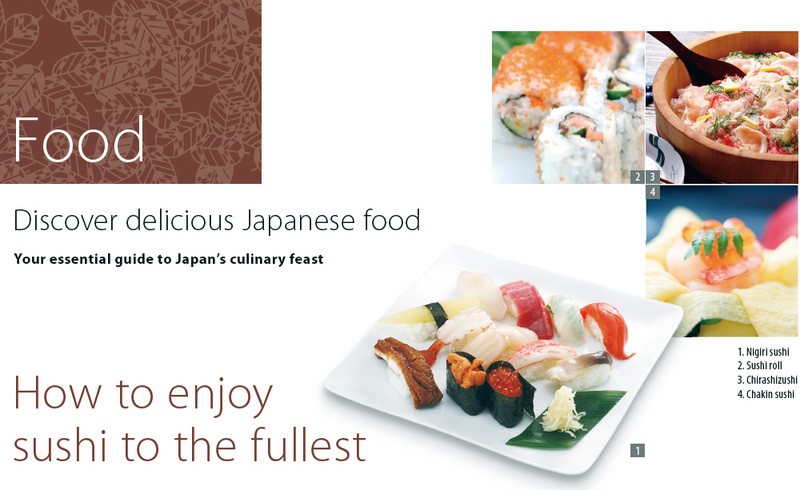 Today, sushi is widely available outside of Japan. In Australia, sushi has become more and more prevalent, with increasing numbers of Japanese-style restaurants opening here. the soy sauce, as there is already wasabi on the sushi itself. Also, when dipping the sushi in the soy sauce, take care not to overdo it. There’s no point getting so much soy sauce that it cancels out the delicate taste of the sushi. can eat it. Flipping the nigiri sushi over so that you get just enough soy sauce on the topping, but not on the rice, is the most delicious way to eat sushi. Incidentally, soy sauce is not necessary with certain types of sushi, such as unagi (eel), that are pre-seasoned with a special sauce. It’s already served with just the right mount of flavouring. As a rule of thumb, start with subtly-flavoured sushi and finish with stronger-flavoured pieces, to avoid overpowering the subtleties of the milder sushi. On the other hand, if after eating something oily such as toro (fatty bluefin tuna) you would like something lighter like a whitemeat fish, then nibble on some pickled ginger. Pickled ginger is not just for decoration, it’s there to refresh your palate. 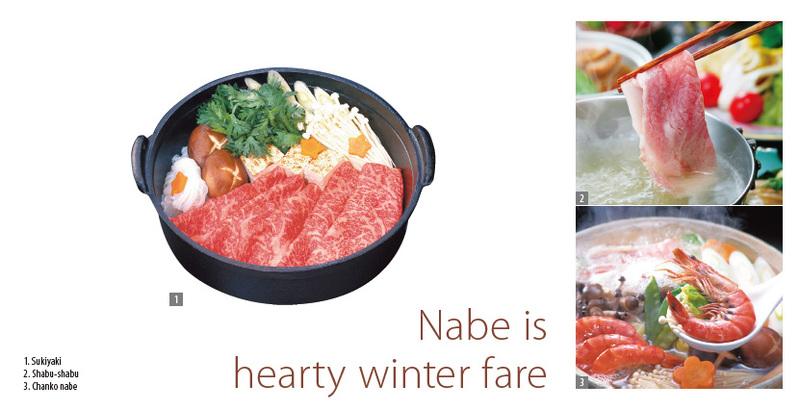 When visiting Japan in winter, nabe (one-pot dish cooked at the table) is a must-try meal. Although it’s possible to have nabe for just one person, sharing a large nabe with like-minded friends is the way to enjoy it. It warms not only your body but also your heart. There are many different approaches to nabe, but perhaps the most famous style is Sukiyaki. style fries the beef first and after flavouring with a little sugar and soy sauce, getables are added followed by sake and water. A raw egg is used when eating Sukiyaki made in either style, as is warishita, a special sauce for Sukiyaki made from mirin (sweet cooking sake), soy sauce, sake and sugar. Japan offers a rare opportunity to eat wagyu beef in its land of origin, and shabu-shabu is the perfect way to experience this premium meat. Beef which has been sliced extremely thinly is cooked at the table by briefly immersing it in a flavoursome pot of stock. The beef is cooked together with vegetables and tofu (soybean curd), and eaten with either a sesame sauce or ponzu (citrus) sauce. It’s truly a mouth-watering taste sensation. Oden, a popular type of street food, is also a kind of nabe, which consists of various ingredients such as daikon (white radish), chikuwa (processed fish cakes), konnyaku (a firm jelly made from devil’s tongue yam) and boiled eggs, simmered in a stock flavoured with soy sauce. Other types of nabe include Kaki (oyster) nabe where miso is spread around the edge of the pot to infuse the boiling oysters, tofu and vegetables. and udon noodles. Trying many different kinds of nabe and increasing your culinary repertoire could turn out to be one of the fun things about travelling to Japan in winter. Ramen is said to be the soul food of Japan. Today each region has its own ramen specialities, and this hearty noodle dish is universally enjoyed. Although it has its roots in Chinese cuisine, ramen has evolved into something unique to Japanese food culture and is now quite different to Chinese noodles from which it originated. 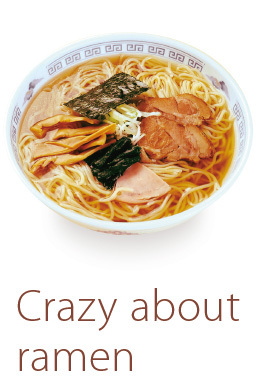 It has even made its way back to China and Taiwan, where it’s called Japanese Style Ramen and is very popular. When visiting Japan, be sure to visit a few eateries that specialise in ramen; you are certain to become a fan. Tokyo ramen is the most common dish, which consists of a broth made from chicken and vegetable stock and a soup flavoured with a special soy sauce and noodles made from wheat flour. Toppings include char siu (barbecued pork), boiled egg, shallots, menma (pickled bamboo shoots), nori (dried seaweed) and naruto-maki (fish sausage with a pink spiral pattern). The noodles should be heartily slurped to enjoy the flavour of the steaming hot soup. Japanese ramen has evolved into many varieties reflecting geographical differences and the particular ramen shop’s style. Each region of Japan is proud of its version of ramen. Some famous ramen varieties come from Hakata and Sapporo. Hakata ramen has a thick Tonkotsu (pork bone) soup made from a wellcooked broth with gelatine melted from bone marrow, and straight, fine noodles. Sapporo ramen, however, has a miso-based soup with thick, crinkly noodles and is topped with stirfried vegetables. Ramen shops make their own signature soup by using stock made from chicken, pork bones, beef bones, katsuobushi (skipjack tuna flakes), niboshi (dried baby sardines), kombu (kelp), shiitake (mushrooms), onions and scallions. By adding sauces made from soy sauce, salt or miso, many flavour variations are created. The noodles are then selected (thick, thin or crinkly) to blend exactly with the taste of the particular ramen soup. Soba (buckwheat noodles) are relished for their aroma and smooth texture, and it is quite acceptable in Japan to make appreciative noises while eating not only soba, but also udon (wheat noodles) and ramen. Soba aficionados place great importance on the aroma and eagerly await the new season’s soba. And there’s no doubt the delicious taste of udon and ramen improves greatly if they are slurped while eaten! It may seem impolite, but it’s actually a long established custom in Japan, so why not give it a go? You may be surprised at the difference in taste!